#2120. 737 N. 3rd, Hampton, NE TASTEFUL UPDATES with respect for the past are reflected in this charming 2-bedroom, 2-bath Hampton home. Features include master bedroom and bath, main floor laundry, original flooring and woodwork, tastefully updated kitchen, and great location near schools. A must-see offering! 2117. 307 John Street, Marquette GREAT INVESTMENT OPPORTUNITY or STARTER HOME! Nicely updated two-bedroom home in Marquette offers a surprising amount of living space! Newer roof and vinyl siding, main floor laundry, and detached garage. Call today! 104 Hwy. 34, Hampton — $225,000 NEW PRICE! 2085. 104 Hwy. 34, Hampton ACREAGE OPPORTUNITY! 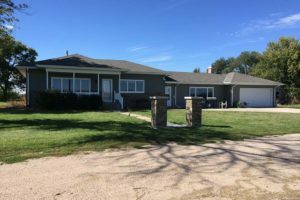 This spacious home located on 2.69 acres boasts an impressive list of updates including new roof, siding, and energy-efficient windows. 3 bedrooms, 3 baths, large eat-in kitchen and family room. Privacy fence and corral. Call today for your appointment! I can’t say enough about the great service we received from the Carol Thomas team, and Preston McDaniels specifically. Preston and the entire team were always there to answer any of our questions whenever we asked them. The house is exactly the kind of property in Aurora we were looking for and we couldn’t be happier. When it comes time to sell, there’s only one Realty Team we’re going to call – thanks, Thomas Team! Laurie Pfeifer of Thomas Realty was our agent. I can't say enough good things about her! She assisted us through the entire process of selling and buying. She was always there when we called upon her and was so helpful in filing all of the necessary paperwork. She never gave up on us. We will highly recommend her to others. Preston McDaniels made the home buying process so pleasant! He went above and beyond to help us find something we loved! Everyone in that office gave us A+ service. Carol Thomas and Preston McDaniels were awesome to deal with. I appreciate all that you did. You could not ask for more qualified, experienced and caring Realtors. Thanks for all of your hard work, it was a good experience. We sold our home in Aurora through Carol Thomas Realty. Laurie Pfeifer was our agent; we were very pleased with the way she handled things from the listing to the closing. Laurie Pfeifer showed it many times, had good contacts, and kept us informed of progress. We would recommend Laurie if you need a good realtor in Aurora, NE. Laurie Pfeifer was my agent. She has not only been helpful prior to and during the sale but has also been helpful after the sale. Everything has went smoothly and would highly recommend her. They NEVER gave up on me!! And found me the home of my dreams, very easy to work with and helped me through the whole process. Thank you, Laurie!!! Preston and everyone at Thomas Realty went above and beyond to help us during our home-buying experience. Preston was knowledgeable on all aspects of each of the homes we looked at and was willing to answer any questions we had. Everyone that we met at the office was very friendly and welcoming. This was our best home-buying experience and we will definitely use Thomas Realty in the future. I worked with Preston McDaniels and was very happy with the whole process. He sold my home in record time. Very professional. I highly recommend Preston. I bought two houses in April 2018 with the assistance of Laurie Pfeifer of Carol Thomas Realty. Both purchases went smoothly and quickly, and it could not have been any easier.